d a n i e l l e b u r k l e o : DANIELLE THE BAKER. NOT THE BLOGGER (CLEARLY). DANIELLE THE BAKER. NOT THE BLOGGER (CLEARLY). Some time along the way I feel in love with baking. I don't know if I loved it as much as a kid but I sure loved throwing flour at my sisters, and my mom's chocolate chip cookies. And, peach cobbler. Peach cobbler, with fresh whipped cream, and vanilla bean ice cream, of course. There isn't anything quite like it. 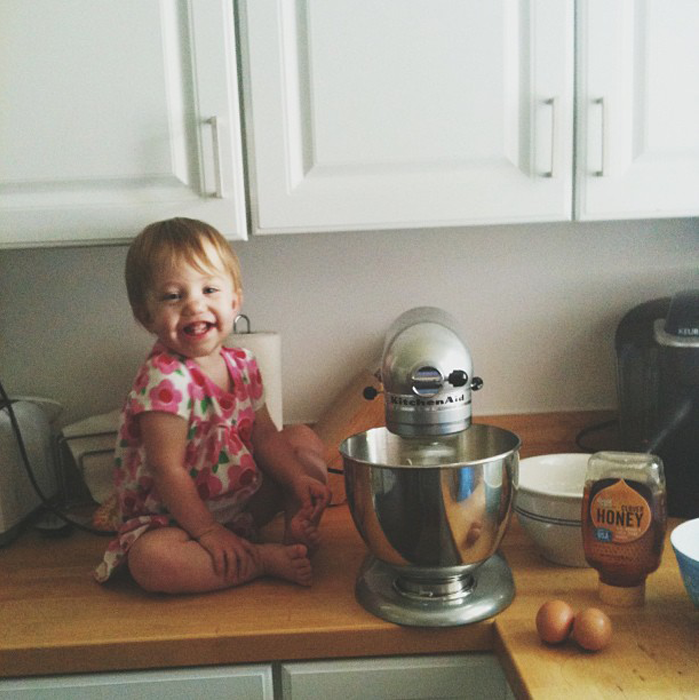 Baking is something me and the kids can all do together and enjoy. Sometimes I am not sure that there is anything else that we can all agree on, but we always agree on this. There's something so rewarding and satisfying about cooking a meal, or baking a treat, for the people you love. This is our thing. It's our three o'clock happy. It's our let's not care about the mess and eat dessert before dinner. I made my first cobbler on father's day. I'll make it again and again now, cause it tasted like summer. Summer and home and berry sweetness all wrapped up into one perfectly golden cobbler. 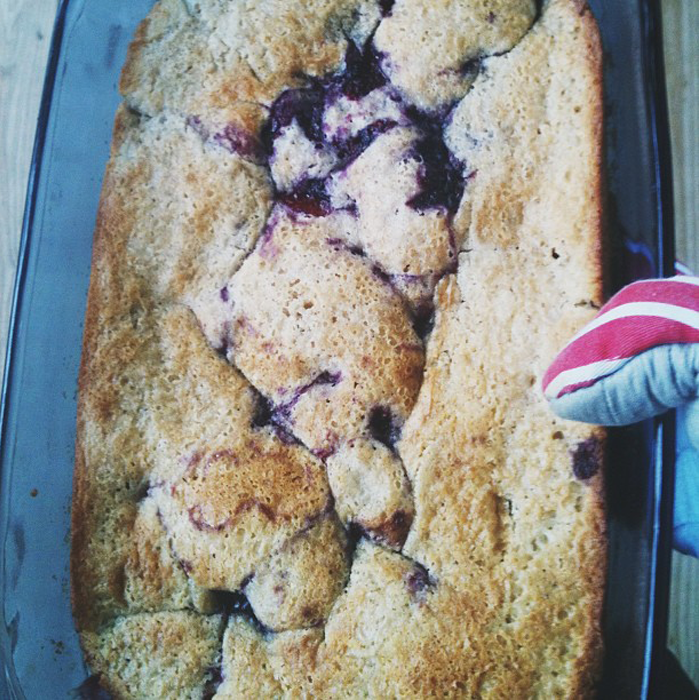 I found the recipe on pinterest, the post it linked to is called The Best Berry Cobbler You'll Ever Have. They are telling you the truth. I followed the recipe exactly, only using a baking dish cause I can't find our skillet. Who can't find a skillet in their kitchen anyway? Me. Preheat oven to 350 degrees. Wash and prepare you berries, and measure out the rest of your ingredients. Mix 3 tablespoons sugar, 1/2 cup blueberries, 1/2 cup raspberries and 1/4 cup water in a saucepan over medium high heat for about 12 minutes. The berries will burst and the mixture will thicken. Pour this into a bowl to cool. In a separate bowl, mix together flour, sugar, salt, baking powder & cinnamon. In a saucepan, or the microwave (let's be honest) melt your stick of butter. I think this step makes the recipe. Butter. I tell my kids that one can never have enough butter. One of life's greatest lessons. Pour melted butter into the bottom of your 9x13 baking dish. Pour milk into the dry ingredients and mix until most of the lumps are gone and then pour this batter over top of the melted butter. Slowly and gently mix the slightly cooked fruit with the remaining uncooked fruit and lemon zest before pouring it around the top of the batter. Do not stir this. Bake the cobbler for 35-40 minutes or until golden brown. Serve hot with a heaping scoop of vanilla bean ice cream. Thank me later. My baking adventures continued today to these life changing things. I'm not sure if I could call them cupcakes or muffins but I am sure that I should call them the best things I've ever eaten. I have this obsession with bananas and chocoalte. Or pumpkin and chocolate. To me, there are no greater combinations when it comes to baking. After Foster was born, when I was nursing him twenty four hours a day, I sat on the couch the week of Thanksgiving and watched food network on repeat. Paula and Giada and Bobby and Alton became my closet friends. My love for pumpkin and banana baked goods grew, and grew, and grew that week. I've never been the same. 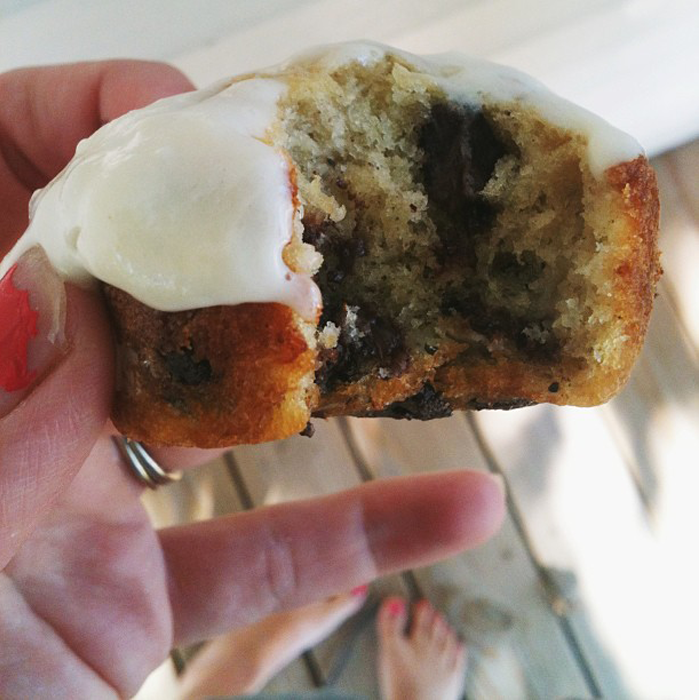 Without further ado, I give you Banana Chocolate Chip Muffins with Honey Cream Cheese Frosting. I know. Can you even handle it? You will spoon feed yourself this frosting and do not lie to me and tell me you didn't. Preheat oven to 350 degrees. Line muffin pan with paper liners, or spray it with cooking spray which is what I did. My kids were convinced they were muffins since there was no liners. TRUST ME, KIDS. These are cupcakes. Whisk together flour, baking powder, baking soda, salt, and cinnamon. In another bowl, mash the bananas until smooth and then mix in the greek yogurt and vanilla. Using an electric mixer, beat sugar and butter together until pale and fluffy, about 3 minutes. Add in eggs and mix til blended. Add flour mixture in 3 additions, alternating with the banana mixture in 2 additions, beginning and ending with flour. With each addition, blend just until incorporated; do not overmix. Stir in chocolate chips. Fill muffin cups around 2/3 full. Bake for 20 minutes. For Frosting: Mix together powdered sugar, butter and cream cheese until smooth. I kept my mixer on medium-high for a couple minutes, scraping down sides as needed. Then, add in honey and beat until smooth. Once cupcakes are cool, frost them up. You will have lots of left over frosting. The possibilities are endless, people, endless. bless you. i will make these muffcakes promptly after my sister's wedding. cause who cares if i can fit into a bridesmaid dress after the wedding. 1. I'm vegan and I'm honestly contemplating making those cupcakemuffinators. Or at least attempting a vegan version..and then giving up and making the regular kind. That photo is making me re-think all of my moral standards here! :) and 2. A friend produces lots of cooking shows for the food network and bravo and so on, and they often need people to come be part of the events/tastings/audiences. I shall tweet you the info next time there's a need. Wow.MUST TRY THESE.You just gave the girls and I something to focus on today since we're staying home. And we'll be using our own homemade honey for those "muffcakes"(love that name). I haven't even had breakfast yet but I'm drooling. I simply cannot wait to make, or eat rather, these amazing looking desserts. Yes, bless you, for sharing such goodness!! !